In the pantheon of business apps, there are four major deities: the word processor, the spreadsheet, the database, and the presentation app. But right behind these, two massively important apps demand our attention: The browser, and the chart builder. Today, it's the chart builder that has my attention. Good visualization is a critical element of business productivity. I've often advocated for the importance of mind maps in generating creative ideas, but an ideal visualization app does more than just map out the free flow of our thoughts. The best visualization apps--including the market-leading Visio--can chart nearly anything in a way that renders complex concepts and processes into intuitive, logical maps. LucidChart is just such an app. The Web-based LucidChart is a do-everything visualizer, capable of mapping out whatever your business demands. 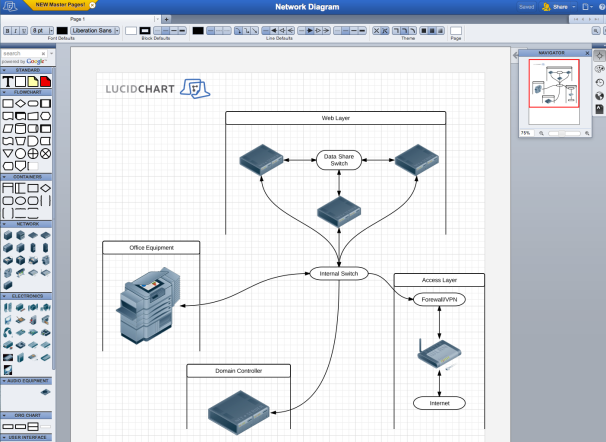 In addition to its preset templates for flowcharts, mind maps, network diagrams, drawings, business analysis, unified modeling language, software and Web design (including specialized templates for iPhone apps), org charts, and floor plans, LucidChart can accept any visual elements you upload. So you could expand it to anything from landscape design to rocket engineering. It's no great accomplishment these days to create a Web app with decent drag-and-drop functionality and real-time collaboration, both of which LucidChart has going for it. But it's a substantial selling point that the app covers these bases well while offering an apparently unlimited amount of flexibility in what it can do. So long as your task entails mapping or charting inter-related ideas, this app has you covered. As a free user, you get 25MB of storage and a limit of two collaborators and 60 objects per document. The $5 per month Personal version lets one primary user collaborate with up to five people with 100MB storage. The $10 per month pro version lets one primary user work with unlimited collaborators with 1GB of storage, SSL Encryption, wireframes and iPhone mock-ups, and stored revision history. At the $25 per month Team level, you get multiple users on the account, everything that comes with the Pro level, and shared template and image libraries. As much as I like LucidChart, I have one criticism: Storage. 100MB is a meager amount of storage for a $5 per month user. In practice, it may prove enough for most people who use the app lightly, but in principle it's an insanely meager amount of space that doesn't allow for the uploading of many graphics. I could see having a limit so low on free accounts, but there's something vaguely insulting about giving paid cloud customers a storage limit measured in megabytes. With that said, however, LucidChart is truly a great visualization app that's well worth taking for a spin in the free version.